The Russian Tea Room dining experience is a worthwhile extra to any trip to New York. Escape the business of the modern Big Apple and be transported back to the 1920’s. When liquor was illegal and tea was served, when there was class and fine dining and when New York was roaring. The Russian Tea Room is the place to be for location, history and art. It boasts a number of artworks by Picasso and Matisse as well being Madonna’s first New York workplace. 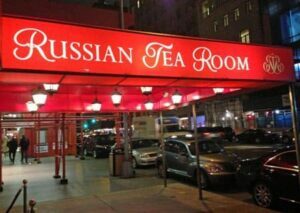 Located in Midtown Manhattan, the Russian Tea Room is right next to the Carnegie Hall and close to Lincoln Center. A lot of the interior is original to the 1927 building, but extensive renovations have kept the ambiance of what it would have been like during the Prohibition (although they do now sell liquor). Celebrating its 90th birthday in 2018, it’s a magnet for poets and businessmen, actors and politicians and a perfect place for a romantic dinner. Dining at the Russian Tea Room is a night out in itself, but if you have tickets for ballet or opera at the nearby Lincoln Center then the staff will be more that happy to seat you for a ‘Pre-theatre’ arrangement. Both lunch and dinner include a 3-course dinner as well as tea and coffee. Be sure to try the traditional way of drinking tea in the 1920’s! By booking lunch or dinner at the Russian Tea Room in advance here, you save a lot on the standard prices. Drinks are excluded; expect the typical New York price of $12 for a glass of wine. 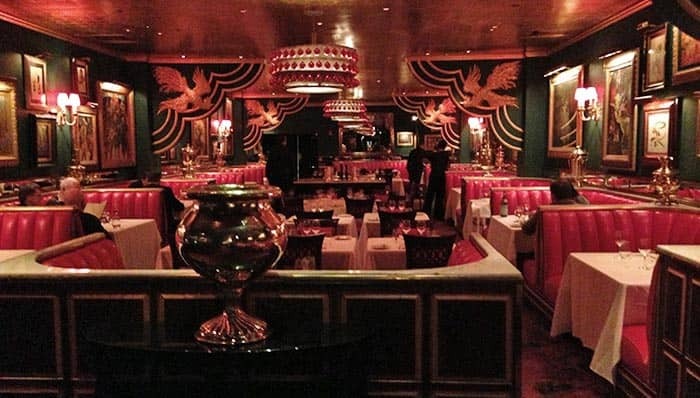 Eric’s Tip: You should take time to enjoy the Russian Tea Room. I highly recommend the Boeuf à la Stroganoff and a glass of wine to go with it. Everything about the restaurant focuses on the overall experience rather than just dinner. The music, the staff, the food and of course the tea are carefully considered to be part of this. Note: Gratuity is not included in these prices and 15% should be included in the payment after dinner.